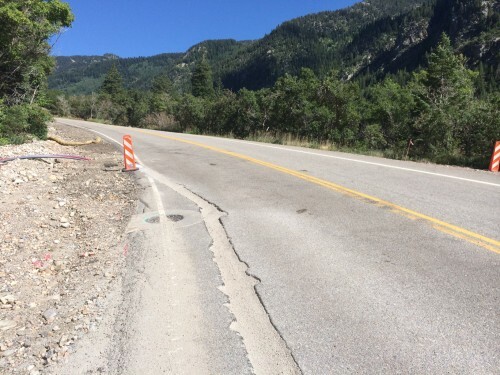 Attention cyclists: please be aware of construction in Little Cottonwood Canyon, Utah. Crown Castle, a wireless telecommunications infrastructure company, is in partnership with the Utah Department of Transportation (UDOT) to install a fiber-optic backed, Distributed Antenna System (DAS) network on Route 210 in Little Cottonwood Canyon to allow improved wireless, cellular, and E911 service. Current construction: In addition to the road debris from construction, there are trench lines throughout the canyon, in both lanes, which may be hazardous for cyclists. Please be aware of these trenches and reduce your speed while traveling through the canyon. The trenches are filled with a mixture of concrete and gravel, which may be loose in some places. The trenches jog out into the travel lane in some areas. This has been the wettest August for Alta in 31 years with 5.33 inches of rainfall. Due to the high amounts of rainfall some of the trenches have been washed out and filled in with cold patch asphalt. Our crews are working very hard to maintain this trench patch as smooth as possible. We will begin the asphalt restoration work next week. We will be replacing the existing trench patch with a new, permanent, wider asphalt surface. We anticipate this work will last approximately 3 weeks. Following the asphalt restoration, our crews will continue to be working in the canyon excavating foundations, pouring concrete, installing cable, etc. We anticipate final completion of the project by mid-October 2014. We appreciate the continued patience of the bicycling community, and remind you that the canyon is still an active construction zone until that time. The antenna poles are 35 feet tall and will be painted brown. The pole boosts wireless services and will hold UDOT weather, traffic, avalanche equipment, etc. 12 new guardrail sections will also be installed along the highway as an added safety precaution. The “hub”, which holds the carrier’s equipment and fiber connections, will be built in the upper end of the canyon, near Alta. The system will allow the means for a service provider (CenturyLink, Verizon, AT&T, Syringa, etc.) to connect a new or existing service to the system. A computer or other device would benefit if connected through a wireless carrier’s mobile hotspot for better streaming. Crown Castle does not provide data service to residences or businesses. With this project, UDOT will increase its statewide fiber network by 9 miles and be able to monitor weather, roadway and traffic conditions within Little Cottonwood Canyon at virtually no incremental cost to Utah’s taxpayers. Please call the project hotline at 801-438-6165 or email [email protected] with any questions or to receive weekly information about the project.